Clean, clever and really funny! 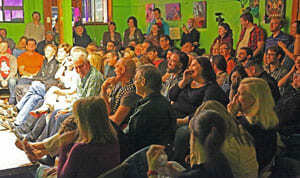 Comedy Heights is a regular Saturday night clean comedy show produced by Al Gavi and Maria Herman. That’s us 🙂 Yes our picture is all over this website. We LOVE to make people laugh. So in September 2013, after our potato juggling act didn’t work, we decided to try a weekly Saturday night comedy show at Twiggs in University Heights. Audiences have been laughing it up ever since. Because Comedy Heights is so close to LA, we attract every flavor of comedian who wants to be on a really good show. On any given night you’ll enjoy vanilla, chocolate and the occasional pistachio. You’ll see comedians who’ve been on shows like Last Comic Standing; The Tonight Show and Letterman; HBO; Comedy Central and just about everywhere else in between. Check out some of our regular comics on the ‘Comedians’ page. You’ll see what we’re talking about. To provide consistently high quality, family- friendly stand-up comedy shows with a variety of headliners, features and fresh faces. Our shows are clean, clever and really funny. To build a successful comedy show that’s attractive to comedians and audience members alike. Produce consistently excellent shows, thereby building a bigger audience to live comedy in general in San Diego. The only thing not clean about our show is the floor. We’re kidding. The walls aren’t that bad.